Pegeen's unique formula and care about its creations and customers is proven though the strong referral and repeat business that they do. Moreover, Pegeen has a fantastic Plus Size Flower Girl Dress Fit program that is so easy and so good that we guarantee the fit, everytime. Since we are manufacturers of flower girl dresses, one of the great number of requests that we get in addition to adding ¾ sleeves to our flower girl dresses for our Jewish clientele, is that for plus size flower girl dresses. Pegeen's Plus Size Girl Division is solving the vast needs of Plus Size Children. "Our program consists of sending a bodice in the mail for them to try on, then we work our charms for the perfect fit". This was recently praised by the mom of a plus size child who wrote: "Marg & the Gang at Pegeen - This is just magic in a box". “It’s so important for a young lady to feel confident in what she is wearing her flower girl dress and this new feature allows you to virtually coordinate your flower girl and ring bearers’ attire,” said Pegeen® President and CEO Marg Hyland. SPECIAL FIT is for girls who are just too hard to fit - sometimes they are very thin and others are stocky. The charge is $30 for chest sizes over 34 1/2" and covers all the adjustments that we need to make. You can choose these options by choosing, as you go to order, the pulldown menu for SPECIAL SIZING. We need the height, chest, waist and hips when you go to check out. If a child doesn't need a bodice fit - the charge is just $20. For PLUS SIZES we will send a Bodice in the mail which is made out of a muslin material. You will try on this pattern/muslin and get back to us with any further fit issues. Be sure to have a digital camera ready when it arrives. After the fit is finalized, we use our copy of the same muslin here and proceed to make your dress. "My staff and I are really good at spotting the problems. Once the digital pictures are sent back to us experience and a little programing magic, produces the changes that need to be made to the pattern. I really scare my kids sometimes when talking on the phone to customers. After they give me the measurements and height, I usually guess their weight within a pound or two. It amazes my kids but reassures the customer that we know what we are doing! I was especially happy when a recent customer said to me 'ITS LIKE MAGIC IN A BOX' and that pretty much says it right there." 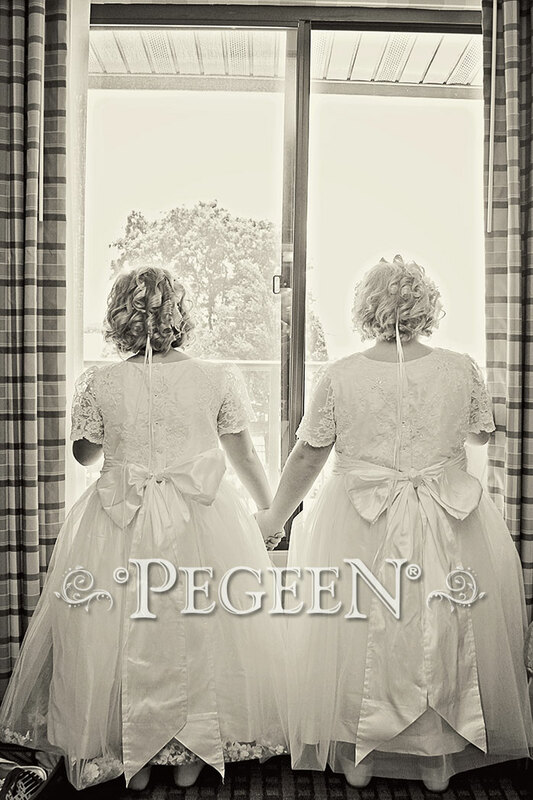 OUR HISTORY: In 1982, innovative designer Marg Hyland formed her company PEGEEN®, and created an affordable line of couture quality Flower Girl Dresses and Ring Bearer Suits. Since that time PEGEEN became the first children's apparel company on the internet and is constantly striving to use the latest web innovations in order to sell her now online-only creations. "We have created a very practical and simplistic approach in order to sell our custom designed clothing in the easiest and most forthright presentation so that customers can now buy our dresses at Direct-from-Manufacturers pricing. This includes custom bodice fitting, guaranteed sizing, virtually any color combination a bride or mom can think of, and easy, fast delivery right to their doorsteps in record time. We produce everything in our own factory here in the US and we are very proud of it. Our success rate is fantastic and 100% - we know it by the amount of referral and repeat business we do! Imagine, customers who were once wearing our dresses as flower girls themselves are now ordering for their children! " said Hyland.